Explore your laravel application routes with Graphical user interface with route name, url & methods. Also track your application api endpoints call counts. Add following package into your composer.json. You can customize your route to anything other than routes-explorer. Change the value of route parameter to your favorite one. It will publish view file to resources/views/routes/routes.php. Customize it the way you want. 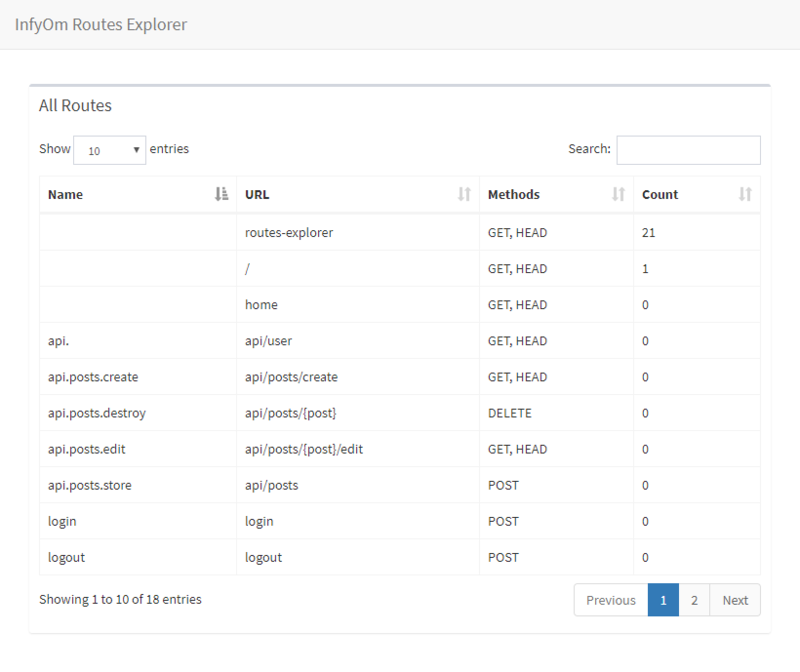 Of course, you need to secure this route routes-explorer in the production environment. You can find option enable_explorer into config/infyom/routes_explorer.php and simply make it false while in production environment directly or via your .env file. By the time, our project grows with lots of routes and api endpoints. And it's really difficult to figure out which routes are most used or used or not used at all. In some cases, we also want to know, which routes are frequently called and we want to cache those data. Other lots of real life practical problems and use cases can be there with our routes. It will publish migration file into database/migrations. It will create one new table in database called api_calls_count. Change config file config/infyom/routes_explorer.php & Make collections.api_calls_count => true. That's all. Checkout your routes and one new column count will be added into datatable.